Nikita has a kind and gentle disposition and has a desire to please. She is an easy keeper, has had two wonderful foals, and is a great mother. She was imported from Denmark as a weanling along with Picasso and Eike. She's lived with Picasso since they were both four months old. Nikita has a wonderful temperament and is the peace keeper in the herd. She gets along with everyone. She's happiest when spending time with people and being outside. While some of our horses prefer being in the barn, Nikita would rather spend her time in the pasture and if you're out there with her, even better! Nikita is being started under saddle as of October 3, 2018 and is doing great. 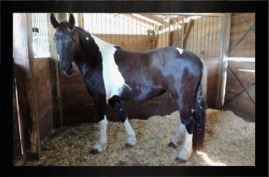 She was previously only used as a brood mare. You can continue her training in the discipline of your choice. Nikita has had two foals and is an excellent mother. At her ECHA-ESV keuring in Denmark, Nikita scored very well: Correctness: 8.0, Movement: 8.5 Overall impression: 8.0, Total: 41.5 Total Points. 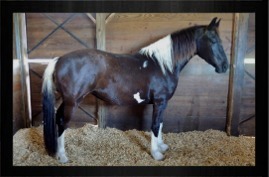 We have also dually registered Nikita in the USA with the Friesian Sporthorse™ Association in the Main Studbook. Within Nikita's pedigree you find Samber on the sire's Warmblood side and such notable Friesians as Oege 267, Brandus 345, Rypke 321, Feitse 293 and Hearke 254 on her dam's side. Oege 267 is known as "The Hair Man" in the Friesian world because his offspring tend to have the thick long manes and tails that he was famous for. Samber was the first and only pinto approved by the KWPN. In 1979 he passed his 100 day performance test with an overall of 160.2 points, which gained him an A pass. He successfully competed at ZZ level in dressage and Z level in jumping. His success wasn’t an accident. His sire was Pericles, Ster, Keur, Preferent, Kern, Super-Premium, one of the KWPN’s most influential, English bred, foundation Thoroughbreds. He was one of the few Thoroughbreds to receive Preferent status and sired over 2600 progeny. 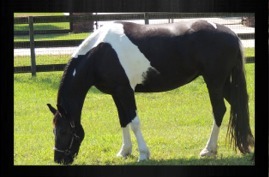 His offspring made excellent sport horses that excelled at both jumping and in dressage. While Pericles was best known as a dressage sire, he did some racing and jumping late in his career. In all he sired 12 approved KWPN stallions including Samber and is the maternal grandsire of Ulft. Samber’s dam was Tina D, KWPN Ster, Preferent, Prestatie mare who produced 19 foals, many of which also obtained Ster, Keur and Prestatie status. While Samber didn’t sire any KWPN approved sons, he was popular in Germany and there he sired the approved stallion Sambucco B and a full sister Evelien. Bambucco B passed on Samber’s genes to no less than nine approved stallions in Germany. Samber also sired Sambertino, Art Deco, and Karel. One of Samber’s daughter was the dam of the famous Ed King Hill who had a successful show jumping career prior to tearing a tendon and having to be put down at the age of twelve. He left behind two approved sons and gained Prestatie status through his progeny. One of most famous successful descendants of Samber to date is the International show jumping sire "Utah Van Erpekhom" Landetto x Calemiro x Samber) who jumps with John Whitaker.